Instantly add contemporary style and upscale elegance to any bathroom or bar with the Miligoré tempered glass round bowl sink. Crafted of superior quality, impact-resistant materials, this beautiful showpiece not only offers exquisite design but durable functionality as well. Featuring a stain and scratch-resistant surface, this 1/2" thick, bowl will retain its original brilliance even after years of use, effectively repelling discoloration and unsightly markings. Installation is simple, as bowl is pre-drilled with a perfectly-centered, beveled drain hole and easily accommodates the use of any standard, non-overflow type drain. Drain opening is standard sized (1-3/4' diameter). Bowl Size: 16 -1/2" (diameter) x 5-1/2" (high), Bowl Thickness: 1/2". Drains and mounting rings sold separately. Miligoré is the premiere source for professional-grade fixtures that combine stylish design with exceptional durability. UNSURPASSED QUALITY: This round glass sink has been expertly crafted to strikingly balance beautiful design with lasting performance. Bowl is meticulously finished with flawless precision, and pre-drilled with a perfectly-centered, beveled drain hole. 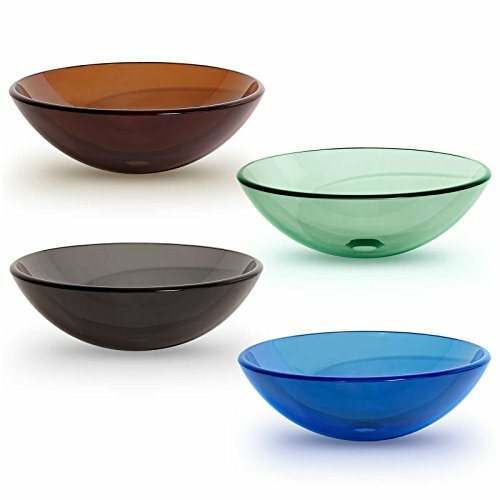 ULTRA-DURABLE: Made from high-grade, single layer tempered glass, this 1/2" thick glass bowl is especially designed for impact-resistance, and features a stain and scratch-resistant surface to withstand everyday wear and maintain its luster, year after year. EASY TO INSTALL: Experience hassle-free installation, as bowl comes complete with a standard sized (1-3/4" diameter) drain opening, allowing for the use of any standard, non-overflow type drain. Can be mounted either above-counter or partially recessed into the countertop. If you have any questions about this product by Miligoré, contact us by completing and submitting the form below. If you are looking for a specif part number, please include it with your message.